The F40 is one of the most incredible cars to ever leave the gates of Ferrari's Maranello, Italy factory. Seeing just one of these wild, turbocharged beasts is a memorable experience. But what about seeing 58 (and possibly more) of them at once? This weekend, just that happened at the Silverstone Classic in England. Y'know, no big deal. 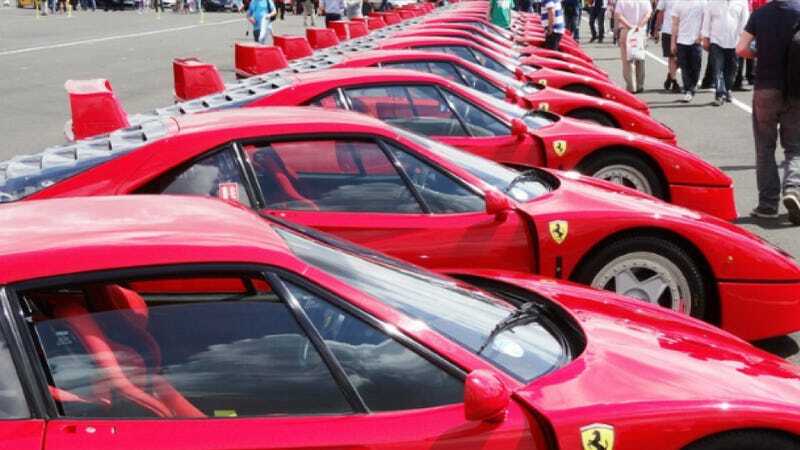 Just 1,315 F40s were built from 1987 until 1992, so this is a pretty sizable number of them to have in the same place at the same time. While I normally find looking at dozens of the same car in the same place kind of boring, meeting a bunch of F40 owners and looking at their cars is probably a tad more interesting than visiting a gathering of the Suzuki Vitara owner's club.